Guest Posts and Giveaways for Christmas at Darcy House! I’m a guest at Just Jane1813 with a guest post about Regency Christmas traditions. You can also enjoy an excerpt from Christmas at Darcy House and a Giveaway! 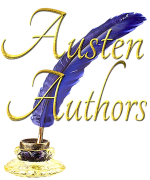 And I’m also a guest at From Pemberley to Milton with a guest post about Astley’s Amphitheatre as well as an excerpt and Giveaway! ← Christmas at Darcy House Now Available at Amazon!